Developers have released Audacity 2.0, the latest version of the free digital audio workstation application. Many effects significantly improved, especially Equalization, Noise Removal and Normalize. Vocal Remover now included plus GVerb on Windows and Mac. VAMP analysis plug-ins now supported. Improved label tracks with Sync-Lock Tracks feature in the Tracks Menu. Multiple clips per track. Tracks and selections can be fully manipulated using the keyboard. Many more keyboard shortcuts. New Device Toolbar to manage inputs and outputs. Timer Record feature. New Mixer Board view with per-track VU meters. Automatic Crash Recovery in the event of abnormal program termination. Fast “On-Demand” import of WAV/AIFF files if read directly from source. FLAC now fully supported. Added support for optional FFmpeg library for import/export of AC3/M4A/WMA and import of audio from video files. 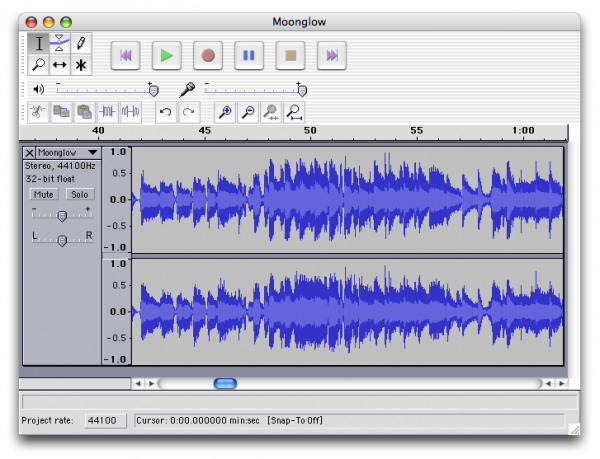 Audacity is popular with podcasters, especially on Windows, because it offers solid basic recording and editing features, and is free and open source. Audacity 2.0 is free and available now for Linux, Mac & Windows.